Be mesmerized by wins and a stunning pair of peepers when you spin the reels of Enchanted Eyes Big Hit Bonanza slot machine from Ainsworth Gaming! This gorgeous new game sits atop 5-reels to offer a total of 25-paylines with a 94.31% RTP. All eyes are on you in this game where you can pile up rewards with bonus feature that include wilds, free spins, scatters and multipliers. Best of all, this game features the Big Hit and Extra Bonus Big Hit features! Wild Princess Symbol – The Princess substitutes for all symbols in the game except scatters and bonus to complete wins. Princess appears on reels 2, 3, 4 and 5 during paid games only. Pyramid Scatter Wins – The pyramid symbol is a scatter and appears on reels 2, 3 and 4 during paid games. It may also appear during the Big Hit Feature and Extra Bonus Big Hit feature. Land 6 or more scatters on the reels to win a prize multiplied by 2x the total bet! Bonus Prizes – During paid games the Bonus symbol can appear on reels 2, 3 and 4 with any symbol. Any three bonus randomly triggers either the Major, Minor or Mini Bonus. The chance of Bonus appearing is proportional to the total bet so the larger you bet, the larger your chances of hitting the bonus. 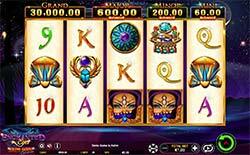 Big Hit Feature – During paid games, any 6 or more scatters trigger the Big Hit Feature which awards 3 free re-spins. Each scatter that triggered the feature will award either 1 or 2 free games that will be accumulated to the free games meter. Scatters are held in position during this round. Extra Bonus Big Hit Feature – During Paid games, the extra bonus big hit feature may be triggered randomly except when the Big Hit Feature or Grand Prize is triggered. 3 free re-spins are awarded and a big scatter will appear over reels 2, 3 and 4. The Big scatter counts as 9 scatters toward the grand prize. When the extra bonus big hit feature is triggered, it will award a prize of 2 multiplied by your total bet. The big scatter will randomly reveal 9 to 18 free games that will be accumulated to the Free Games meter. If one or more additional scatter appears, those scatters are held and the number of re-spins remaining is reset to 3.